Midas and Behringer are among the top brands in the electronics industry, and they’ve graced the market with numerous premium-quality products. Today, we’re going to pit two gigantic mixing consoles against each other and evaluate their performance. We’re going to start off by reviewing the key elements of each console, after which their performance will come into play. If you’re having second thoughts regarding which one is better, this review should provide some clarity on the issue. Midas M32 is a marvelous recording console which features 40 input channels. It even comes with eight DCA groups, eight stereo processing engines, and 25 MidasPro 100-millimeter faders. Using the AES50 networking technology, you’ll be able to utilize a total of 96 ins and outs, which is considerably more when compared to similar consoles within the price range. The open architecture design is as beautiful as it is durable, but it also boasts lightweight properties, as it weighs substantially less than an average console. The premium MIDAS quality represents style, given that it’s the latest letter in the alphabet of technology. Now, the Midas sound is defined by the award-winning patented Midas microphone preamp. It allows for deep, warm ambiance while maintaining spatial positioning, all that while capturing accurate images. Lastly, there are sixteen FX plug-ins which are all based on the TruePhysical™ modeling. Basically, Midas M32 will bring you more than fifty effects for you to play around. Overall, Midas M32 seems very valuable for the cash. It’s certainly great and excels in numerous fields of performance, but we’re yet to see how Behringer’s X32 will fare against such an opponent. Behringer’s X32 is one of the finest high-end mixing consoles you could get for the money. Even though it isn’t exactly cheap per se, it boasts a substantial value for the price. Firstly, this console features an exemplary number of both ins and outs. It comes outfitted with thirty-two gain-programmable microphone preamps, six TRS aux inputs, sixteen XLR outputs, and a well-balanced Control room outs. You’ll be able to use the X-USB interface card which makes the Behringer X32 fully compatible with most major DAWs. This convenient feature allows you to utilize Pro Tools, Cubase, DP, Logic, Studio One, and other DAWs as soon as you unpack your console. There’s a neat FX rack onboard which will allow you to use eight multi-effect processors (sixteen mono processors). Up to four stereo reverbs can be run together with 8 channels of graphic EQ, easily eliminating the need for additional outboard hardware. 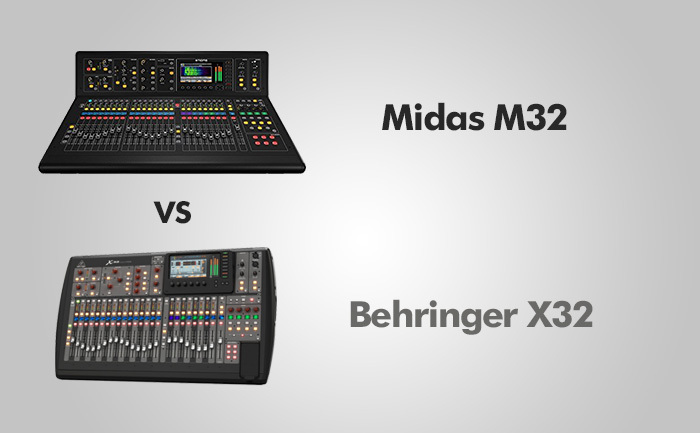 In summary, Behringer’s X32 is pretty close to Midas M32 in terms of features. Both models boast 40-input channels, and both are characterized by exemplary performance and versatility. Frankly, both Behringer and Midas make great mixing consoles, but M32 and X32 seem to be evenly matched here. Both of these models excel in performance, and most sound engineer professionals can name only a couple of arguments why they prefer one over the other (most of which are entirely subjective, though). However, since they’re made by different brands, hence different technologies were used, it’s only normal that one of them has to be better. Objectively, Midas M32 is just a bit stronger in this sphere. It allows for more precise sound customization, and the features it comes outfitted with are slightly superior. Most arguments regarding the Midas M32 versus Behringer X32 end when the price comes into play. Namely, Midas M32 is substantially more expensive than the X32, which easily dissuades people who have a low budget. Regardless, those people who look for the ultimate console would find both of these models as valuable – even though Midas M32 costs a small fortune, it’s well worth the cash. As for the X32, it’s certainly not cheap, but most people who actually want the M32 end up with it at some point in time. Many people have busted their heads with the question which model is better, and there’s a plain logic hiding behind it – there are simply too many similarities between these consoles. People using the M32 advocate the statement that it’s better, and vice versa, but there are several real differences which should answer the aforementioned question. First of all, the M32 feature latency-compensated buses. Lags, however small, could be a major thorn in the side, especially on live performances. Simply put, the X32 won’t compensate for the latency introduced by FX (inserted from FX rack), but M32 will. On the other hand, Midas M32 is much lighter, and it features a more beautiful outward appearance. Even though aesthetics are of little concern, this is a viable, visible difference between that model and the X32. Apart from that, there are dozens of miniature, hardly mentionable differences that set these two apart. CONS: Costs a small fortune / Robust, but somewhat unwieldy during transportation. CONS: Bulky and heavy / Slightly inferior performance when compared to Midas M32. Proclaiming Midas M32 as the victor in this versus match did not come lightly. Both of the consoles we’ve reviewed are major in every aspect – exceptional performance, premium-quality features, state-of-the-art technologies. The M32 is much alike X32 in numerous spheres of performance, but the tiny differences are clear and true. That being said, we hope that your doubts regarding which model is better to have been cleared – Midas M32 is victorious in this contest.